Because of a number of possible causes of stroke — part of your brain may be deprived of blood. When that happens, it doesn't take long for your brain to suffer. In a nutshell, the glucose and oxygen transported by one of the brain’s arteries are not reaching some part of the brain, which in less than a minute will begin to shut down. And you will show signs of stroke. 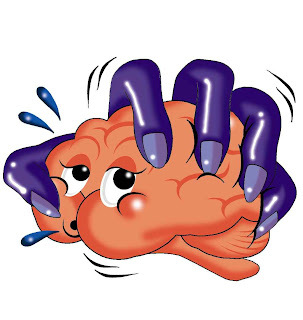 Most of the time, a stroke victim feels no pain as the stroke is occurring — so there is not much evidence to clue you in that the reason your hand looks funny and doesn't move when you want is because there’s something wrong in your head. Most people who have a stroke don’t know what is happening to them. Most people who see someone who’s had a stroke don’t know what is happening. A stroke doesn't hurt (except if a headache accompanies it), and its most obvious effects are far from the brain where the problem is located. This means a lot of people don’t recognize they are having a stroke and can’t use the opportunities they have to get into the hospital quickly and be treated.